Join the Young Professional Network of The Otsego County Chamber for a networking mixer on Thursday, September 27, 2018 at the Cooperstown Brewing Company 111 River Street, Milford, N.Y.! Join our friends and neighbors from Destination Oneonta and Destination Marketing Corporation for Otsego County. If your new to the area and looking to expand your network of Professional connections this is the place to be! Please just show up if interested in attending. RSVP not required. 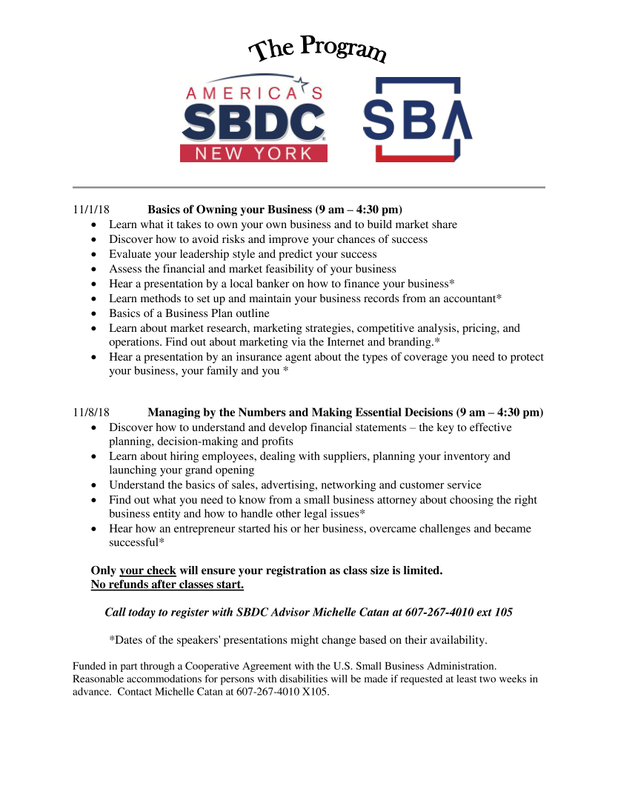 For questions please contact Barbara Ann Heegan at [email protected] or call (607) 267-4010 Ext. 103. Stop by and sample one of their brews, networking with local professionals and maybe win a door prize! The Otsego County Chamber will be conducting the Ribbon Cutting this Friday, September 28, 2018 at 3:00p.m. for new member Cooper Country! 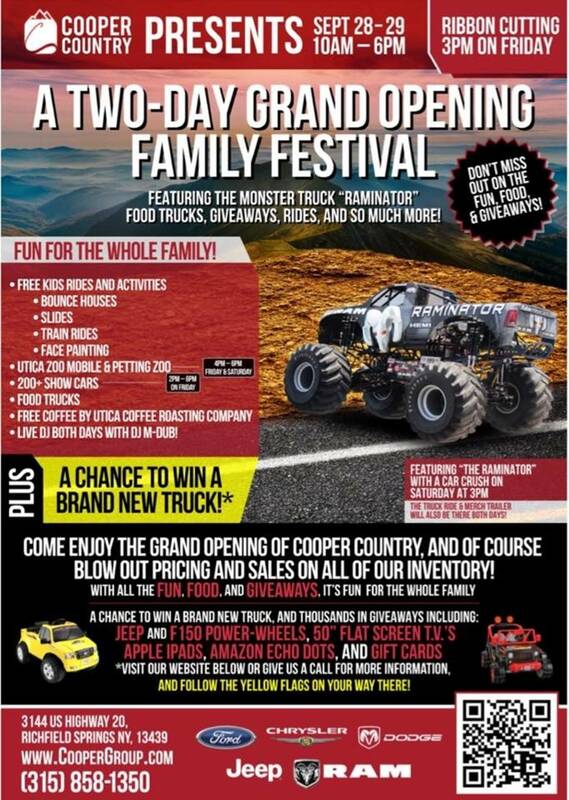 Please Join us for this Grand Opening Family Festival! The Greater Oneonta Historical Society (GOHS) will hold its Annual Meeting and Hofbauer Award Reception on Wednesday evening October 3 at the History Center, 183 Main Street. The meeting will begin with the reception at 6:30 PM with the award to be presented at about 7:00 PM. Liz Morley will receive the Eduard Hofbauer Outstanding Service Award. Morley joined the GOHS Board of Trustees in 2015 and has served as Chair of the Programs Committee since that time. Her nomination states that In addition to this important role, she has helped prepare exhibitions and is an active member of the Benefit Auction Committee. She gives of her time generously to GOHS and and is being honored her for the countless hours she has spent planning and hosting programs, setting up and breaking down events, soliciting donations, sprucing up the History Center, and staffing the gift shop. After refreshments and the presentation of the Hofbauer award, there will be a short business meeting, including annual reports and the election of Trustees and officers. The evening, with refreshments, is free and open to the public, although only GOHS members may vote. Prior to the meeting and awards reception, beginning at 5:30 PM, there will be a presentation by Colby Yeaton, Business Development Manager of Collette Tours. GOHS in cooperation with Collette Tours is sponsoring an April 2019 trip to San Antonio. Highlights of the tour include tours of the Alamo and Mission San Jose, a visit to Lyndon Johnson's Texas White House, and a boat ride along the River Walk. Anyone interested is free to attend and get further details, including costs, travel arrangements and how this trip is a fund raiser for GOHS. For more information about any aspect of the evening, contact (607) 432-0960 or [email protected]. The award winners will be honored at the Chamber’s Small Business Banquet that will be held on Thursday, October 11, 2018 at The Otesaga Resort Hotel in Cooperstown. Cocktail reception with cash bar begins at 5:45 p.m. with live music. Guests will enjoy a harvest of culinary delights at 7:00p.m. including turkey and all the trimmings in keeping with the theme “Harvesting Success in Otsego County”. Your invitation is attached to join us in celebrating our award winners. There are also congratulatory ads attached to share good wishes to our honored guest. We look forward to seeing you at this spectacular event. Join us at the Southside Mall Job Fair, Thursday, October 25th from 3 to 5pm. Agencies & Training Providers are welcome to participate and promote services & trainings. Have your customers “save the date” to meet directly with HR staff who are hiring. Attached are the Exhibitor's Registration form and the Job Seeker flyer. Watch our website: www.cdoworkforce.org for list of participating businesses, agencies and training providers. A Workshops for Job Seekers to get ready for the Job Fair will be held on Monday, October 22, from 10:30am to 11:30am at the CDO Workforce Center, 12 Dietz in Oneonta. Call 607-432-4800 x 100 or visit the CDO Workforce to register for this informative and practical workshop. With so many businesses using impersonal on-line applications, this is an opportunity for job seekers to meet in-person with HR Managers who are hiring. ALEXANDRIA, Va. (Aug. 22, 2018) — Barbara Ann Heegan, President & CEO of The Otsego County Chamber of Commerce, has been selected by the Association of Chamber of Commerce Executives (ACCE) to participate in a national professional development program designed to boost innovative community health initiatives. Professionals selected for ACCE’s year-long Healthy Communities program will participate in a design-thinking lab that will help them develop and implement a plan to tackle a specific community health challenge. Curriculum is designed to help participants demonstrate the leadership role their chamber of commerce can play in strengthening quality of life and supporting equitable prosperity. Each participant will work with a local community partner throughout the program. Bassett Healthcare Network is the local community partner for the Otsego County Chamber of Commerce. Ms. Heegan will collaborate with Dr. Henry Kurban, Medical Director, Performance Improvement Department, on a two-fold community health challenge: (1) Promotion of Mental Health and Prevention of Substance Abuse and (2) Prevention of Chronic Disease. Leaders selected to participate in the 2018 Healthy Communities program represent chambers of commerce in Arizona, California, Florida, Indiana, Montana, New Jersey, New York, Texas and Wisconsin. The program is made possible with support from the Robert Wood Johnson Foundation. ACCE, the Association of Chamber of Commerce Executives, was founded in 1914 and today represents a membership of nearly 10,000 professionals who work for and with more than 1,300 chambers of commerce around the world. ACCE’s members represent the largest metropolitan regions in the United States and Canada, in addition to major metropolitan regions abroad. Based in Alexandria, Virginia, the mission of ACCE is to support chamber professionals so they can lead their communities. Learn more about us by visiting www.ACCE.org. Bassett Healthcare Network is an integrated health care system that provides care and services to people living in a 5,600 square mile region in upstate New York. Bassett Medical Center, the foundation of the network, is a 180-bed acute care inpatient teaching facility in Cooperstown, New York, employing 3,000 people. The medical center offers a broad range of specialty care and maintains a strong academic program through its affiliation with Columbia University College of Physicians and Surgeons and is a medical school campus of Columbia P&S. In addition to Bassett Medical Center, the network includes five other corporately affiliated hospitals, over two dozen community-based and 20 school-based health centers, and various health partners in related fields. Learn more at www.bassett.org.